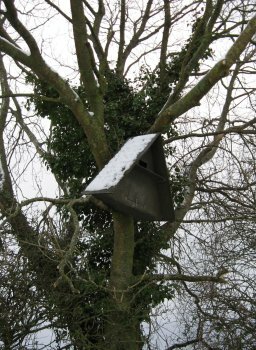 Since 2004 we have had owl and kestral boxes in ashtrees around our 7 acre oak sapling plantation, the idea being to reduce the field vole population which predated on our young oaks. 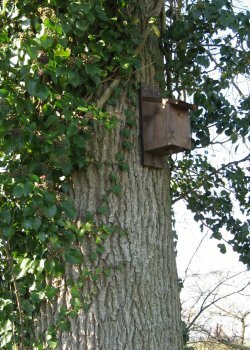 A friend (Derek Voller from Essex) also made 12 small-bird boxes for us, which we attached to the tall ash trees. 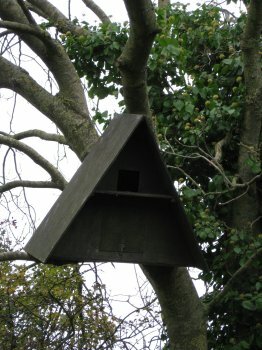 Here are some photos of these assorted bird boxes and their inhabitants. Jason Fathers is the Project Officer for the Chalk and Hawks Projects. 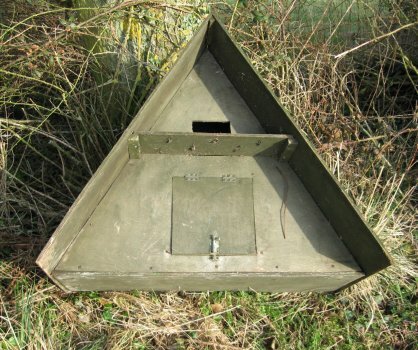 He calls on our plantation in June to check our 2 barn owl and 2 kestrel nest boxes. 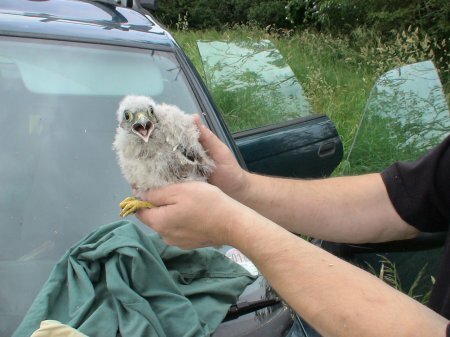 In 2006, due to the dry weather, he only found an abandoned clutch of kestrel eggs. He pointed out that I could not take it home as an object of interest, but let me take a photo before leaving it in situ. Jun 06. 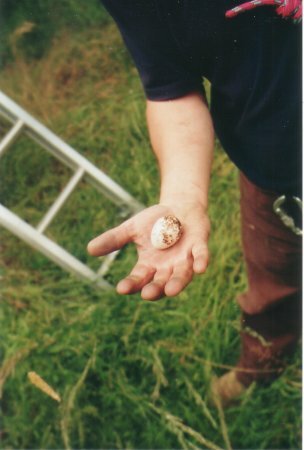 Jason shows an abandoned kestrel egg. Jason Fathers is the Project Officer for the Chalk and Hawks Projects. 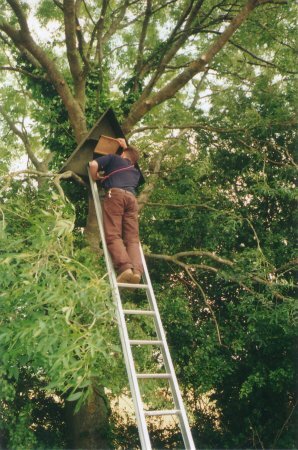 He calls on our plantation in June to check our 2 owl and 2 kestrel nest boxes. 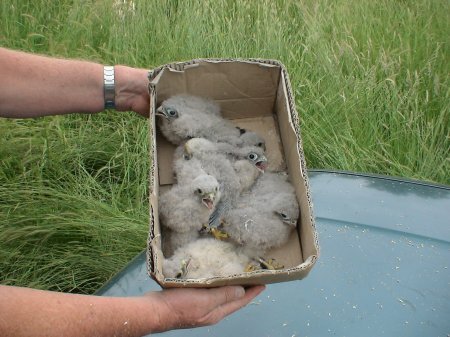 In 2006, due to the dry weather, he only found an abandoned clutch of kestrel eggs. 2007 was a much wetter year. 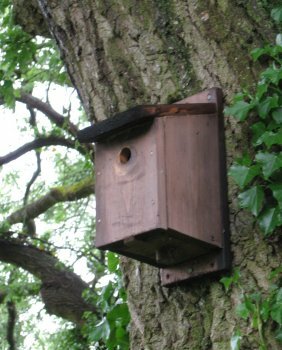 On 13 June he called again, and found 6 healthy kestrel chicks in their nest box 15 ft up in a dead ash tree. He ringed these and put them back. 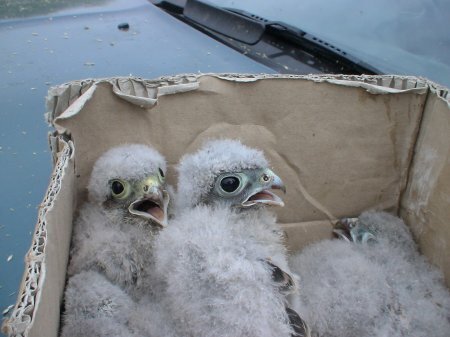 Since then I have watched them peer out of the box, take food from their Mum, fledge, screech to their parents to be fed from nearby trees, and slowly learn to hunt for themselves. They have been eating the field voles that eat my oak saplings, Bless them. 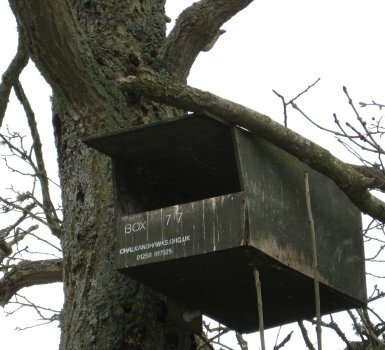 It has been an absolute delight to watch their parents mate on top of a dead tree, the downy chicks appear in the nest box, the birds fledge, and fly between the mature trees around my plantation hedgeline. Wildlife programs on TV are all very well, but you can't beat seeing it happen yourself. 57a. 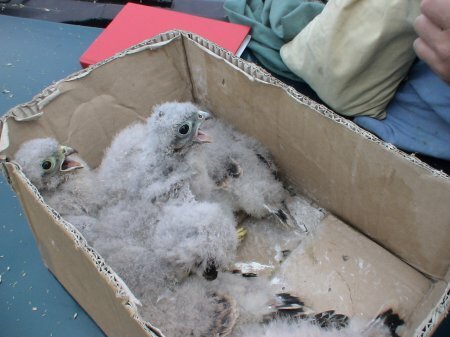 Jason puts 6 chicks into a cardboard box, and brings them down to show me. 57b. They are covered with down, but have murderous beaks and claws. 57c. 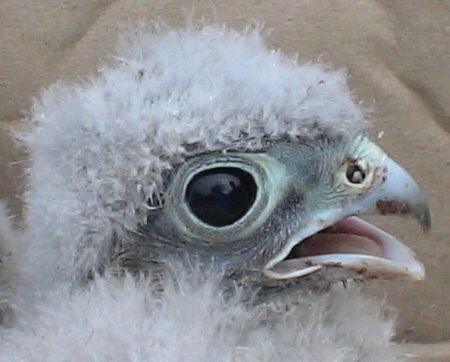 A chick makes a loud protest at the indignity of being handled. 57d. Jason gets his tools ready to ring each chick. 57e. All 6 are ringed, taken up the ladder and carefully put back in their nest box.